Connie rose from the table, economy office chair squeaking. She tried not to look at the cheap novelty watch wrapped around Dthlrap’s feeler as she shook it. As the molluscan creatures slithered out of the GalactiCorp meeting room, Connie couldn’t help but lean over the glass table and smirk at her own reflection. Won’t be long for that promotion now. Connie bumped into Jerry on the station lift. Jerry was a few years her junior, but rising almost as fast as she had. As usual, the grease from his hair had slid down to the lapel of his jacket and no one had told him. “News travels fast,” Connie said, rolling her eyes. Most people at GalactiCorp liked to boast up and down the company grapevine when they closed a deal. You never knew when the next promotion or restructure might shake things up. Today’s breakroom buddy might be tomorrow’s bigwig. Still, Connie usually kept to herself. She spent enough time jockeying with buyers; she didn’t need to play the game with coworkers, too. Connie shook her head and stared at the elevator doors. “When do they not?” The technological gulf between their species made humans scary and intimidating to the hygos. That gulf didn’t exist, of course. Or if it did, it went the other way around. But the hygos would believe human technology ran on fairy dust if you told them. Then they’d ask what fairies are, and GalactiCorp would step in with a nice deal on ‘fairy enclosures’ that would bear more than a passing resemblance to cockroach farms. “I wouldn’t give them one. I told them our research department had already evaluated the Shiny Cola for safety. I didn’t want them making their own knock off.” Connie let go of the door and clasped hands, tapping her thumbs together. “Ah, yes, the ‘research department.’ Well, hey, they’ll figure it out soon enough. Maybe the casualties won’t be too bad. And I’m sure Weaver won’t realize until after you nab that promotion.” Jerry winked. Connie’s stomach did flip flops. Weaver. As the doors closed, Connie jammed the button for the executive suite. He’ll blame me if this causes an incident. Why didn’t he warn me? She pictured him leaning over his desk, yelling about recklessness, jowls quivering. Then the image shifted to a crowd of hygos clutching ice-cold bottles of Shiny Cola, raising their feelers in a toast. A strange sensation crawled up the base of her ears. Was that . . . guilt? Connie took a seat in Weaver’s office, battered by the dueling odors of shoe-polish and unsmoked cigars. The gas giant outside GalactiCorp Station peered through the office window, casting an orange halo around Weaver’s head. The Bruce Springsteen bobble-head on his desk glared at her. Connie didn’t know which boss to look at. “Say no more.” He put a hand up. “Bonus coming your way. Keep closing deals like that and you’re promotion bound in no time. Just don’t start eyeing my desk.” He gave her a wink and a phony grin. “‘Little pink cash registers,’ I know. We’ve all seen your motivational posters, sir. It just seems like we’re taking a risk with this sweetener thing. You could have warned me.” But who am I kidding? You wouldn’t lift a finger for an ambitious upstart like me unless you were going to use it to hit the airlock button. “Ever heard of skroopball?” He pulled a plastic-wrapped cigar out of his desk drawer. He turned to face the gas giant in the window and tapped the cigar against his palm in an odd rhythm. Only every time you’ve told this dumb story. She flicked Bruce Springsteen in the face on her way out. Weaver would be no help. When Connie first started working for GalactiCorp, she’d looked up to him. Hell, she’d wanted to be him. But the more she propped him up with sales, watching him swoop in and take the credit, the more she came to despise him. Each time he stepped on some eager new salesperson or delivered another office lecture on ‘what it takes,’ she grew sick to her stomach. She could never be like him. No matter how many deals she closed. No matter how high she climbed. Never. She stepped back onto the lift and reached into a jacket pocket for her tablet. Its paper-thin surface became rigid as she unrolled it, powering on with a swipe. Another image flashed in her mind of those Shiny Cola shipments and the unsuspecting feelers they’d end up in. She’d told Dthlrap he could nurse his spawn on the stuff. His spawn. With an inhale, she pulled up the facecom app and dialed into her contacts. She tapped Dthlrap’s icon, but after a few seconds trying to sync, the screen became a light gray: USER UNREACHABLE. His ship must have entered the superluminal envelope, streaming toward the unpronounceable Hygoelus homeworld. Real-time communication would be impossible, and any message she sent via comm buoy would take at least a week to arrive. She had to get out in front of this. Guess I’ll put that vacation time to use. Connie had never been to a Hygoelus world before. She’d never seen so many of them in one place. The locals slinked about the stardock, emotive tentacles a rainbow of surprise, concern, and wonder as she passed. Some rolled by on segways and repurposed office chairs, feelers flailing. Others clutched at earth-made tchotchkes and trinkets–virtual pet keychains, decorative spoons, novelty watches–evidence of previous hustles, some of which Connie recognized as her own handiwork. No doubt they’d been told the useless items would improve their mental alacrity, fend off harmful wireless signals, or some other sale-inducing nonsense. The blue crystalline building they led her to looked grown rather than built, jutting from the ground at odd angles. The inside smelled of dust and cardboard, and she soon saw why. Stacks of boxes and crates bearing the GalactiCorp logo towered in the corners. Passé posters and decorations from Earth clung to the walls. At each shimmery turn, she had to dodge broken toys, ceramic cats, and classic rock bobble-heads. Connie’s throat tightened with each earthly junk-piece she encountered. She had expected to find GalactiCorp merchandise here, but the sheer volume took her aback. They’d been dumping this crap on the hygos for years. “No, the fault is all mine. But I have good news and bad news.” Connie took a deep breath. As Dthlrap’s people led her to temporary accommodations, Connie contemplated the gravity of the situation. Her promotion hung in the balance–maybe her entire livelihood–and her fate lay in the sticky feelers of those she’d made a career of deceiving. For the first time in her life, she felt at a disadvantage against the hygos. And every time her eyes landed on one of the GalactiCorp logos that marred this otherwise beautiful construct, she couldn’t help but wonder if she deserved it. Connie’s impromptu vacation neared its ninth day when she woke to the sound of her tablet chiming. She rolled out of the GalactiCorp brand waterbed the hygos had given her. A voice message from Weaver waited in her inbox, dated the day she left the station. Stupid slow comm buoys, Connie thought. Hope it’s nothing. She pressed play. Damn it. He knows. Connie flopped down on the waterbed, preparing for the worst. Jerry. It had to be Jerry. The bootlicker must have gone to Weaver after our little chat in the lift. He thinks he can knock me down and take my spot. Connie’s fingers tightened around the edge of the tablet. How could I be so stupid? “I don’t know what’s worse, Connie. That you didn’t pitch smart like I taught you, or that you lied to me. You treated me like some damned fool hygo. Needless to say, I’m not happy. We’ll have a long talk about your future when you return. Connie rolled the tablet shut, resisting the urge to throw it across the room. She tried to go back to sleep, but all she could do was grit her teeth and glare at the GalactiCorp poster hanging over her bed. There goes my promotion. I came all the way out to this hygo backwater for nothing. The one consolation was knowing the Trade Council likely received their own message from Weaver, or soon would. She could leave this mess in his hands instead of waiting around another week. Connie inhaled, contemplating her next move. Weaver meant to take her down, to destroy her career. She always knew he resented her swift rise through the department, but she’d never have predicted he’d go this far. He wanted the hygos to drink that poison swill. He wanted another sweetener scandal, so he could point the finger at Connie and get rid of her, lest she replace him one day. Thousands of innocent hygos would fall ill–or worse–to secure Weaver’s place behind his desk. She’d never carried any guilt for swindling them in the past, but this went far beyond some petty hustle. She couldn’t let this happen. Dthlrap still stared at her, his tentacles gray and unmoving. Connie facepalmed. This would be harder than she thought. When she first heard Weaver’s message, Connie thought she’d never traverse the stench of his office again. Yet now, she found herself wading back into it. He watched her with narrow eyes as she took a seat. He leaned back in his polyester chair and tapped a thumb on the desk, saying nothing. She didn’t. But she wanted him to believe she’d learned her place, that she’d crawled back here to prostrate herself and beg for her job. She knew Weaver. Even if he still meant to sabotage her career, he couldn’t resist the chance to lord over her. She broke eye contact, as though ashamed. Damn right. But you couldn’t let it happen, could you? “What we do is an art form, I’ve said it time and time again. Just because these dumb aliens believe anything you tell them doesn’t mean you can tell them absolutely anything. And if you do manage to flub a deal, you don’t cover up and hope it goes away. If you’d have worked with me on this, I could have helped you. I didn’t get where I am today by lying to my superiors.” He rose out of his chair and grabbed a cigar out of the desk drawer. “Skroopball. Hell of a fad.” He turned to face the gas giant in the window and tapped the cigar against his palm. Connie smiled inside as he droned on for the hundredth time about the big sale that got him the big desk. While his eyes were still glued to the window, she opened her jacket and peered at the inside pocket. The RECORD icon on her tablet was still flashing. In Connie’s line of work, you had to massage the truth from time to time. Of course, her line of work had been in a state of flux after the board reviewed her conduct and terminated her employment. But then her old friend Dthlrap had come through. She hadn’t been sure what to expect from the Hygoelus, considering the things she’d done. They had every cause to be angry with her, even after hearing the recording she made. The last thing she expected was a job offer. “Yes, yes,” Weaver said, glaring at her with naked disdain. “That’s all well and good, we’ve read the communiques. But what the hell is that on their heads?” He gestured toward the group of hygos standing behind Connie, Dthlrap among them. Weaver’s jowls began to quiver. He closed his eyes and breathed loudly through his nose. His grip on the side of the table loosened. Connie cracked open the can of Shiny Cola in front of her, took a sip, and waited. “We can. You ought to read your contracts, Mr. Weaver. There’s a nice long clause about ‘knowingly trading product of a harmful or defective nature.’ Did they mean to put that in there?” She made a tsk tsk sound with her tongue. As Weaver and his GalactiCorp cronies slithered out of the meeting room, still fuming, Connie couldn’t help but look into the glass table and smile at her own reflection. I love this job. J.W. Alden lives near West Palm Beach, Florida with his wife Allison, who doesn’t mind the odd assortment of musical instruments and medieval weaponry that decorate his office (as long as he brandishes the former more often than the latter). 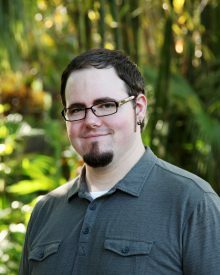 Alden is a graduate of Odyssey Writing Workshop, a 1st Place Writers of the Future winner, and an active member of SFWA. Read more from him at his website, or follow him on Twitter. Megan Leigh is co-host of the feminist speculative fiction podcast Breaking the Glass Slipper. 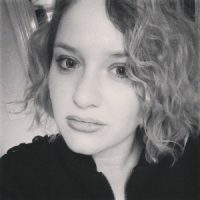 Her writing has appeared on Pop Verse, SFWA, SFF World, Pornokitsch, and Writers’ Workshop.